Data is streaming in every three and six hours. Models are finally beginning to sample the storm as it is now over the continental United States and moving southeast. Everything still looks like a "go" for a Post-Christmas Snow Storm. The biggest challenge with the snow is "who" and "where"? All models keep a storm happening but there is a bit of a split between the models. NOAA's GFS and NAM take more of a north/northwest track whereas the European, Canadian and RPM computer models keep it on more of a southern track. A southern track would be preferable for big snows in southeast Missouri, extreme southern Illinois, western Kentucky and south/central Indiana. Hot off the presses... 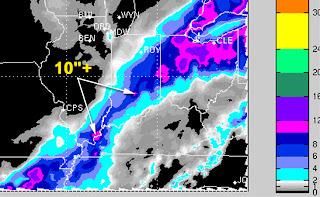 Here is the new 12z run of the RPM. I am still waiting for specific amounts to come in but you can at least see the map. This is through 6am CT Thursday. Notice the amounts are down in some areas compared to last night's run. Also note that the heavy band of snow is slightly further east. That is due to the model taking the storm a little further southeast. 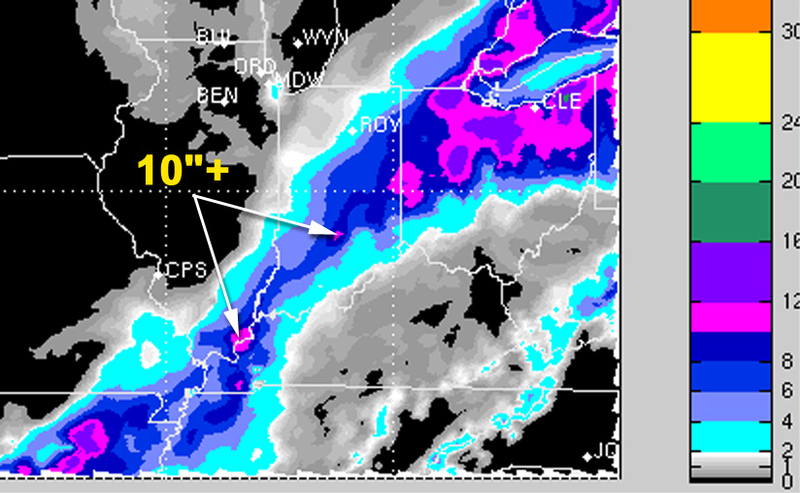 Here is an updated snow matrix with two runs of the overnight RPM and last night's GFS. What isn't included in the numbers is that a lot of areas (i.e. western Kentucky, northwest Tennessee and southern Indiana) will likely start out as rain. There could be a little sleet mixed in and then change over to all snow. I am still a little concerned in regards to snow amounts that a small layer of warmer air (above freezing) could come in at the surface. This would drastically reduce the accumulated snow. There is still a LOT that has yet to be determined. I suspect we will see the computer models all start to come together and provide more detail over the next 12-24 hours. Keep in mind, this storm is still 36 hours from beginning in northeast Arkansas and southern Illinois. As I was just trying telling a family member, trying to give out detailed information with specific locations is like a sniper trying to hit a pea from 5-miles. Freak-Out-Meter: I'm going to change this up a little and give a meter number for different locations. 9:25am Update: I still believe someone could get a foot snow from southeast Missouri to somewhere between Seymour, IN and Frankfort, IN. One of those 10" plus arrows is pointing right at my town. Quite a change from yesterday!